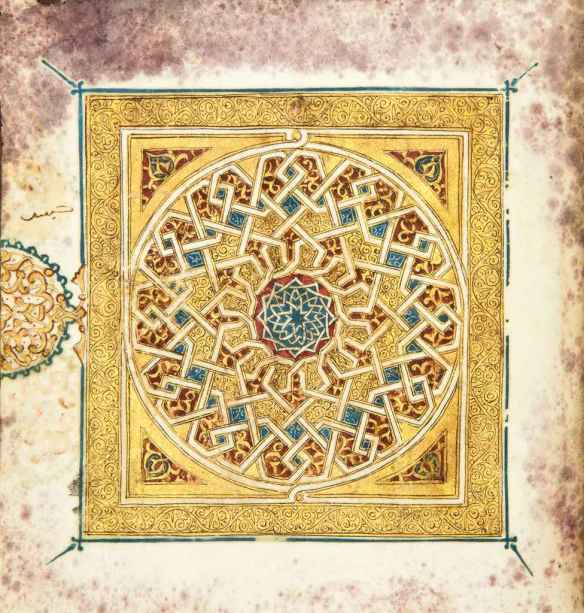 This is a draft cover for my new collection of short stories and poems. 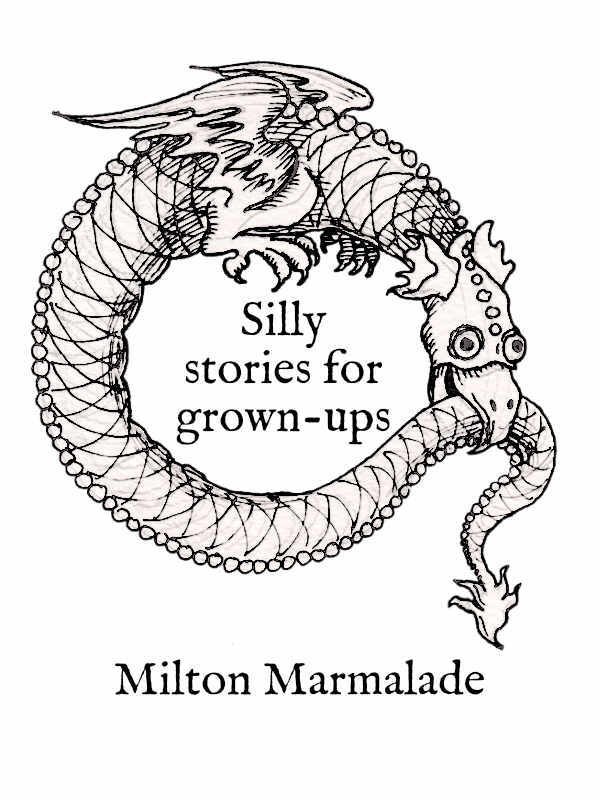 The revised title will be Milton Marmalade's Remarkably Silly Stories for Grown-ups, and the cover will be very stylish when it's finished. Remarkably Silly Stories are all copyright, all rights reserved, and if you steal my stories and I later get famous my lawyers will certainly be after you. My lawyers are called Bloodfang & Wolf and they have a reputation. If you go into their office on a full moon you will find yourself at the front desk where a very pretty woman sits. In one corner is a carved wooden candlestick holding a fat off-white church candle, its tiny flame guttering ineffectually. You see the woman by the moonlight streaming through the gothic windows. She is wearing a black dress calculated to show off her figure, in which roundness in all the right places is emphasised by an almost unfeasably small waist. She has raven hair and her eyes are pools of darkness. Though she is beautiful you feel for a moment as though you are staring into the soul of an animal. You ask to see one of the partners but she tells you ever so sweetly that since it is a full moon neither of them are in. However she assures you that your case is in the best hands and anyone who steals your work will be sure to regret it. Somewhere outside you hear a scream which you think may be a fox or maybe not. Because she is smiling at you, and also because her low cut dress suggests breasts of surpassing wonder, you think about asking her out on a date. The moonlight casts a glint on one of her unusually sharp canine teeth. You lose your nerve and find yourself out on the pavement again wondering quite what happened. The fox, or whatever it was, screams again, briefly, then there is silence. Check back again soon for updates on the book, which will be pocket-size and as affordable as printing costs will allow. 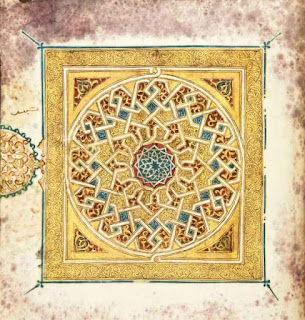 Ibn 'Arabi refers to The Reality, meaning (as far as I can tell) that God is objectively real and implying that our subjective states are just that - their reality is partial and dependent on something larger. In our post-Enlightenment world we tend to view the world the other way up, as though our subjective beliefs were the touchstone of reality. We see, as St Paul says, 'through a glass darkly.' Or as Xenophanes has it, 'Only the gods see things as they are, but for us it is a woven web of guesses' (cited in Popper, The World of Parmenides). We are so habituated to seeing the world as it were upside-down that we take materialist explanations (chemical changes in the brain etc.) as more real than the experiences themselves. We think we are phenomenologists but our post-Enlightenment discourse is full of mechanistic hypothesis. It is difficult to think outside the materialist paradigm. If we met something greater than ourselves we would reduce that to a chemical change in the brain, even though we know that experience forms and reforms the brain through neural plasticity. Causation works in both directions. Delusions and hallucinations occur, but not everything that we experience is illusory. Sometimes we don't know which way is up. For this reason we don't understand Parmenides. His Way of Truth is his approach to reality, and his Way of Illusion (a reputedly large work now mostly lost) described what we would think of as science. Does that mean we should abandon science? Assuredly not, because that which belongs in the material realm can correctly be dealt with by the methods of the material realm. Fantastical notions are still subject to appropriate demolition.